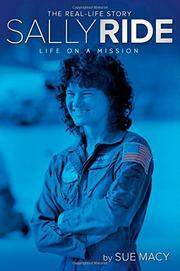 A fast-moving, straightforward and up-to-date biography of the first American woman astronaut. Arranged chronologically, the 10 chapters are narrated with appealing energy, interspersed quotations humanizing the book’s subject. From a tennis championship in high school through a Ph.D. in physics to her flight into space, Ride was a dedicated model of achievement, scientific and otherwise. Macy provides detailed descriptions of her training and the many hurdles involved in selection as an astronaut, and she answers the basic questions about everyday functions in space (eating, washing, toileting, etc.). Boxed insets here and there add side information and context. Macy makes it clear that Ride’s career did not end with her groundbreaking flight, celebrating her activism in the fields of science and women’s rights. Privacy was of utmost importance to Ride, but the glare of publicity made it difficult to maintain. There were two issues that she managed to keep from the public until her last days: She had pancreatic cancer, and she was gay. The introduction addresses both up front. The extensive backmatter provides scholarly data, while the writing imparts the drive and character of this famous woman.